One week after the Israeli election victory of Prime Minister Benjamin Netanyahu’s right-wing Likud Party, tensions between Washington and Tel Aviv remain at a level unseen in decades. President Barack Obama on Sunday gave a videotaped interview to the Huffington Post in which he recounted a mealymouthed rebuke that he said he had delivered to Netanyahu over his 11th-hour appeals to the most reactionary and racist sections of the Israeli electorate to win the seats needed to secure his reelection. 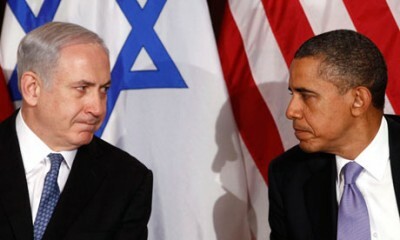 The US president’s problem is that in his desperate bid for a fourth term in office, Netanyahu clearly proclaimed the real policies of his government and the entire ruling Zionist establishment in Israel, exposing the so-called “peace process” brokered by Washington as a cynical fraud. For over two decades, since the signing of the Oslo Accords in 1993, Washington, Tel Aviv and the Palestinian Authority (PA) in the West Bank town of Ramallah have all promoted the notion that a “two-state solution” could be achieved at the negotiating table. During this period, the Israeli regime has steadily created new “facts on the ground,” doubling the number of Zionist settlers in the occupied West Bank to over 300,000, while leaving 2.7 million Palestinians trapped in bits of discontiguous territory divided one from the other by Israeli settlements, checkpoints, military outposts, walls and security roads. Another 1.7 million are imprisoned within the Gaza Strip, blockaded by both Israel and Egypt and subjected to continuous military assaults such as the criminal Israeli siege of last summer that claimed the lives of over 2,300 men, women and children. These predations have underscored the reactionary, antidemocratic character of any so-called Palestinian “state” that might emerge under the aegis of US imperialism, the Zionist ruling elite and the Palestinian bourgeoisie, should that ever come to pass. It would be an impoverished, discontinuous, demilitarized entity, essentially a prison for the Palestinian masses. Under these conditions, the pretense that the so-called “peace talks” provided a way out for the Palestinian people was not merely a fiction, but an obscenity. Yet the pretense served a useful purpose for all those involved. For Israel, it provided a mask for the predatory policies it pursued in effectively annexing ever-greater portions of the territories it seized in the 1967 war. For the Palestinian Authority, it served as a rationale for the Palestine Liberation Organization’s transformation into a client regime of US imperialism and an auxiliary police force for the Israeli occupation, securing in the bargain foreign aid and loans that flowed into the pockets of the corrupt leadership around PA President Mahmoud Abbas. For Washington, the “peace process” allowed it to posture as a neutral party attempting to secure a just settlement for both Israel and the Palestinians, a lie seen as essential to its attempt to secure the collaboration of Arab states in US imperialism’s unending wars of aggression in the region. Everyone—most of all the Palestinians—knew that the process was a fraud, but those directly involved were not supposed to say so publicly. In his explicit rejection of a Palestinian state, Netanyahu has cut across US interests in the region. This comes on top of his March 3 anti-Iranian tirade to the US Congress, which was organized in league with the Republican Party leadership in an attempt to sabotage any negotiated agreement on Tehran’s nuclear program. The Israeli regime remains intent on using the spurious claims of a nuclear threat from Iran to draw the US into a war for regime change in order to further Israel’s own strategy of exercising unassailable dominance over the countries of the region. This runs counter to the current policy pursued by the Obama administration, which aims at reaching at least a temporary accommodation with Tehran as Washington prepares for new military confrontations around the globe. While Obama vowed that, his disagreements with Netanyahu notwithstanding, “our military and intelligence cooperation to keep the Israeli people safe continues,” the recent clashes underscore the crises gripping both US imperialism and its obstreperous Zionist client state. Both seek a way out of their respective crises by military means, but their immediate timetables and agendas are significantly at odds. For both the Palestinian and Israeli working class, the reelection of Netanyahu on a platform of unconcealed Zionist aggression and reaction only underscores the absence of any way forward based on the program of nationalism. For Jewish workers in Israel, Zionism is a trap, subordinating their interests to those of a narrow oligarchy of capitalist billionaires and multimillionaires, while the ruling establishment seeks to divert the immense tensions generated by poverty, rising prices, austerity cutbacks and record inequality into ever more dangerous military provocations against the Palestinian people, the surrounding Arab countries and beyond. For Palestinians, the protracted fraud of the “peace process” has laid bare the dead end of Palestinian nationalism and all of its variants, from Fatah to Hamas, all of which articulate the interests not of the working masses, but of rival sections of the Arab bourgeoisie. Nowhere is the necessity for the international unity of the working class posed more sharply than in the Middle East. There is no way out of the present impasse and the threat of ever bloodier catastrophes outside of Arab and Jewish workers uniting against imperialism and its Zionist and Arab bourgeois agents in a common struggle for the United Socialist States of the Middle East.